The first thing I did when I arrived at the Wine Bank on View was imagine myself sinking into the leather couch by the fire with a coffee and dessert on the way home from a late movie. Then I remembered an autumn afternoon I’d spent in the courtyard, wine tasting under the guide of an expert from a local vineyard…lovely French accent included. We once sought refuge from the warmth of summer under the cool cavernous ceilings and dark wooded interior, having drinks with friends between ceremony and reception. But today, I was here for a lazy lunch, flipping through the Sunday papers with a slow cooked lamb shoulder ragu. That’s my favourite thing about the Wine Bank, there’s room to share so many spaces and occasions within this stately Victorian era building…it can be whatever you need it to be. I love wandering the little “passageways” formed by the walls of bottles, browsing the names and regions of their wine selection. 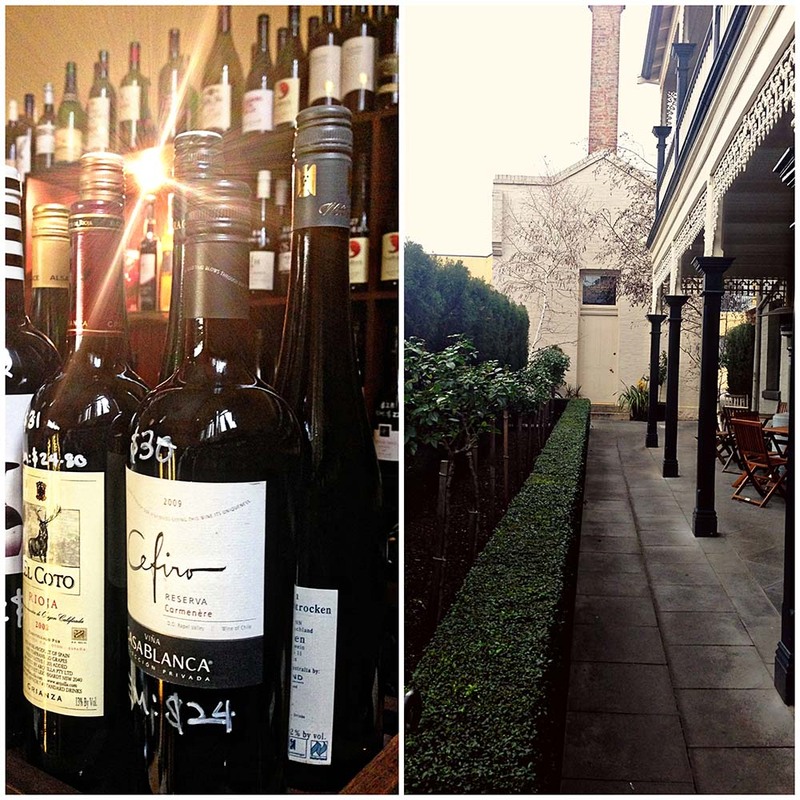 There are over a thousand choices, vintages from our own doorstep in Bendigo through to the reaches of Italy and Spain. The private function “Guard’s Room” at the top of the staircase intrigues me. Being built in 1876 to house various banks, I wouldn’t be surprised if there are some good stories to be told. I’m already planning a brunch with visitors from Hobart…truffled eggs and smoked salmon outside overlooking the View Street arts precinct sounds like the perfect way to begin the day. But then, a cosy catch-up dinner with old friends in an alcove with its very own fireplace also sounds tempting. So, when will you next visit the Wine Bank on View? The gentle creaking of a lovingly restored tram built in 1929 combined with the smooth sounds of local Albert “Skip” Skipper and Hailey Calvert is the perfect soundtrack for a sunny Saturday afternoon. As part of the upcoming Bendigo Blues and Roots festival, the Blues Tram leaves Central Deborah Goldmine, inching its way along the heritage backdrop of the city streets. Bendigo Beer, known for their passionate support of craft beer locally, co-host the event. Passengers are provided with a carefully curated selection of drinks (including wine and soft drink) from which to purchase both before and during the trip. Our own local brewery, Brookes Beer, is well represented. We took our inaugural trip on a winter’s afternoon so we warmed up with a coffee and hot chocolate at the beginning…and whilst a selection of snacks is also available, bringing your own little collection of handmade chocolates from Indulge in Bath Lane never goes astray. What I loved most was being so close to the performers that you could feel their feet tapping through the floor and the vibration of their music through the wooden window frames. It’s such a unique experience to see a tram full of passengers captivated with every note belted out by Skip (who waves to pedestrians mid song, and accredits his excellent balance in the travelling tram to his surfing days). Then, coming to life between songs, the audience enthusiastically chats with the musicians exchanging anecdotes and laughs. Hailey has us spellbound during songs of love lost and wanderlust in Manhattan. As we’re trundling back into the tram depot, she performs her soft soulful encore. When I hear the term Milk Bar, my mind is instantly transferred back to the days of Bubble O’Bills, and white paper lolly bags. With your nose pressed up against the glass cabinet, you were faced with the epic decision…mix your own selection to maximize the ratio of Mates and Milk Bottles…or face the unknown with a pre-mixed bag. Nowadays when I’m at Percy and Percy cafe ordering my coffee, I feel a wave of nostalgia when I see the little bundles of “Mr Forbes Traditional Mixed Lollies” lined up on the counter. So who was Mr Forbes? Luckily for the curious minded, the first page of their delicious menu explains it all. In the days of black and white photography and before supermarket giants, Percy Watts ran a small grocery store on the corner of Baxter and Hargreaves streets. When the store changed hands, Percy Forbes turned it into more of a traditional style milk bar. Last year locals Elisha and Dan fell in love with the building and the stories its walls contained. They now own the delightful Percy and Percy café, and their strong sense of pride in the history of this space is represented in the photography displayed on the walls. With a cheerful interior of industrial meets indie, Percy and Percy is well and truly part of our regular brunch rotation. I love the extra touches like the tiny teddy biscuits that accompany coffees, and that muesli arrives with Jonesy’s milk in cow shaped jugs. There’s plenty of space to spread out with the weekend papers on the communal table, or to find a sunny spot for good conversation on the side porch. It looks like work is beginning on their `backyard’ which sounds promising for summer holidays. In addition to a tasty selection of breakfast and lunch fare, those seeking sweet treats for afternoon tea will appreciate the baked goods and intentionally mismatched china. The space has a genuine old school feel…and I think the original Percy and Percy would heartily approve. Be inquisitive....take your time. There is much to explore in the streets and laneways of this city, more stories and experiences to share.